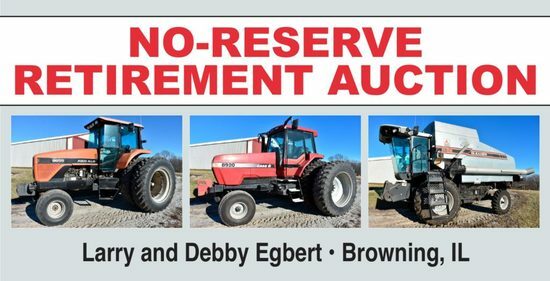 Selling tractors, combine & heads, planting equipment, hay equipment, grain trucks and other farm equipment and farm support items. Driving Directions: From the west edge of Browning, IL go north on Massachusetts St. continue north on Ridgeville Rd. for 1.3 miles to Friddle Branch Rd., turn left or south on Friddle Branch Rd. for 0.3 miles to the farm. Browning, IL is located approx. 10 miles northeast of Beardstown, IL and approx. 10 miles east of Rushville, IL.